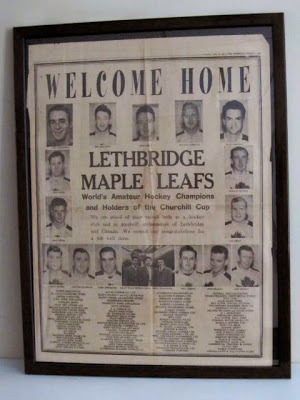 It is a great pleasure to continue to maintain our www.lethbridgemapleleafs.com site. Over the years, we have been enriched by our contact with the players, players families, and the many fans at home and around the world. The Lethbridge Maple Leafs World Championship victory has just past the 65th anniversary of their win in Paris, France in 1951. 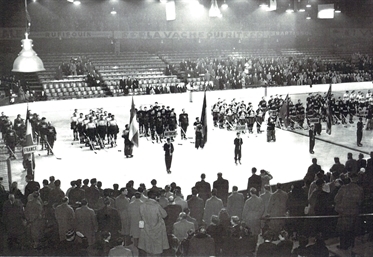 Now, 66 years later, Paris, France will host the World Championships again. The International Ice Hockey Federation (IIHF) has asked us to write an article summarizing the Lethbridge Maple Leafs and their incredible journey. We will post a link to the article when it's published on their site. 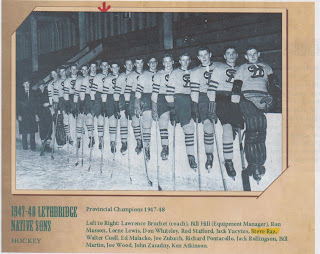 If you have memories or photos from the Lethbridge Maple Leafs journey please contact us lethbridgemapleleafs@gmail.com We would like to post them on this site. account of his experience for us that we published on our site! his memories of the journey and championships! 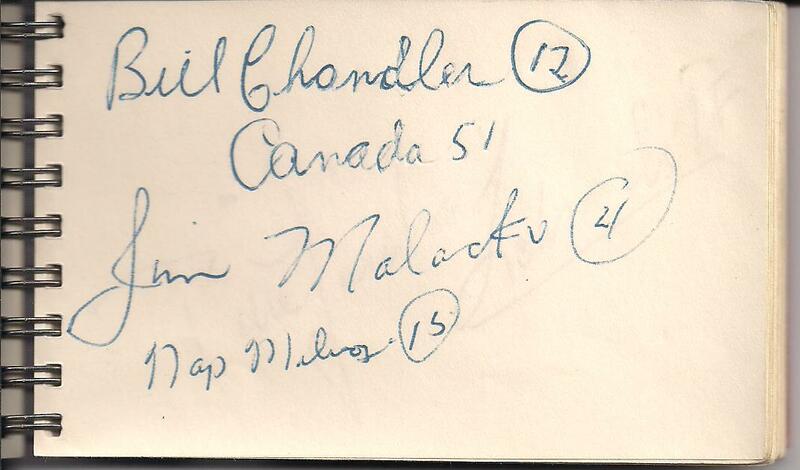 I've had limited contact with the Three (3) Ontario Players that were sent over just prior to the 1951 Championships in Paris. 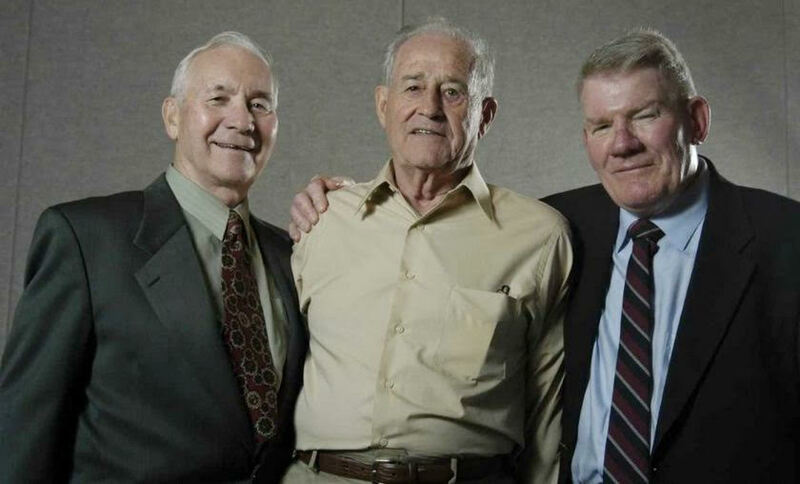 After Shorty Malacko's passing - these 3 players were the last living remaining Players..
Just Leaves Micky (Lyle) Roth as the last living Player from this Team. Thanks to Karen Dill for responding to our request for more information about Steve Raz. 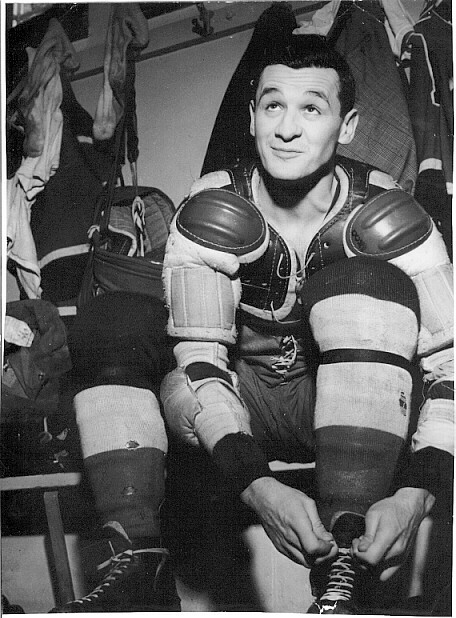 In early 50's he played for Michigan State University. He was married to my cousin." 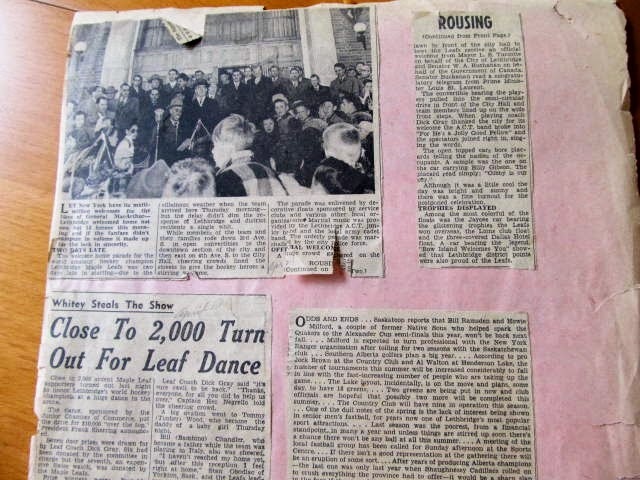 James Sinclair forwarded these articles to post on our site. 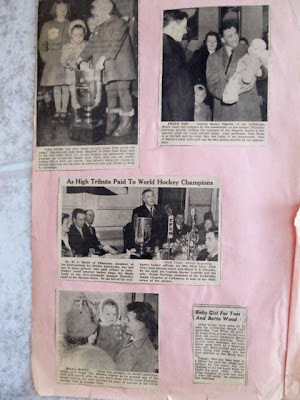 Maxine Malacko (Jim Malacko's widow) found this newspaper among her late husbands' hockey collection. The articles present a mystery player. 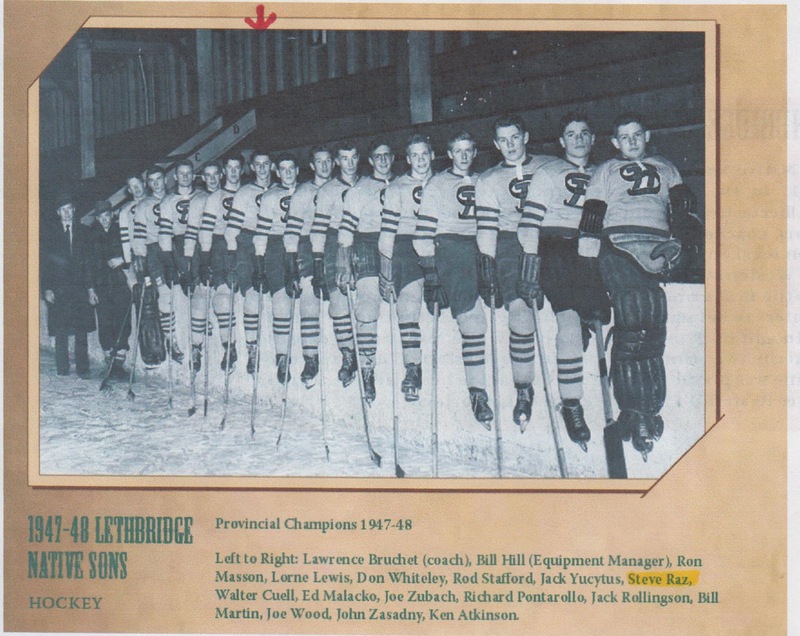 Steve Raz's picture appears in the paper but he does not appear in any further Lethbridge Maple Leaf information. James writes, "I was shocked/surprised to see a picture of "Steve Raz" in this paper. 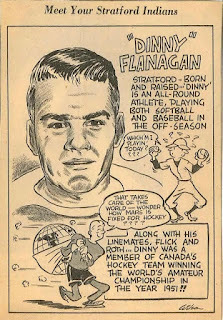 I have never heard of this name before, I don't recall any of the former players ever mentioning this fellow?" 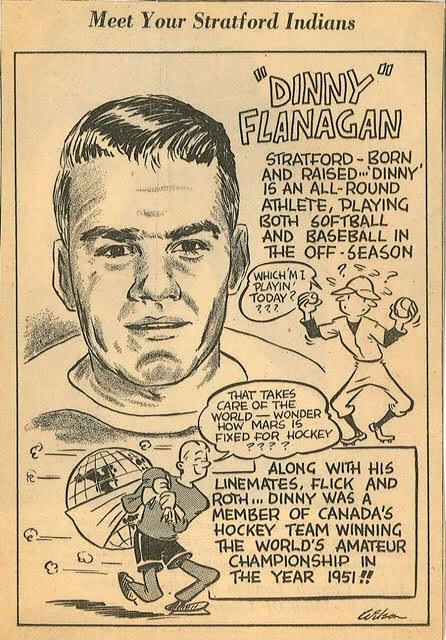 James speculated that Don Pilling of the Lethbridge Herald probably had to send this article out to "Ice Hockey World" Newspaper in London, England weeks, if not months in advance in order to get published in time for the Maple Leafs arrival. 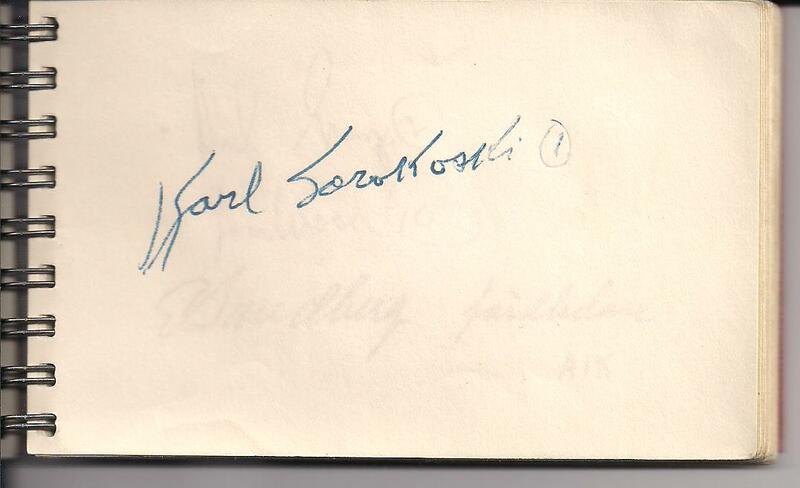 Thanks to Lars Ingels from Leksand, Sweden. 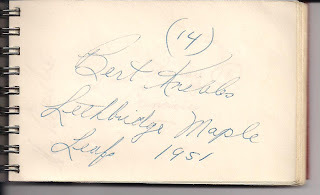 He emailed us recently and said his dad collected all of the Lethbridge Maple Leafs players autographs when they played there in 1951. 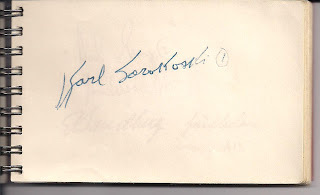 Lars still has the autograph book. James submitted this great photo of the Lethbridge Maple Leafs in close quarters in a very small dressing room they encountered on their journey to become World Champions! 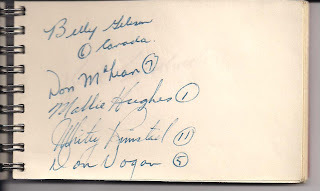 L-R Mallie Hughes, Jim Malacko, Bill Chandler, Whitey Rimstad, Lou Siray, Tom Woods, Stan Obodiac.. 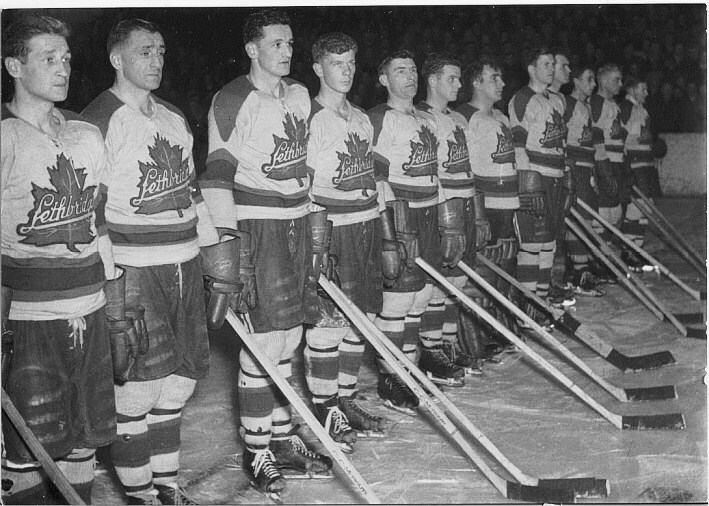 The IIHF has also posted this video showing film footage of the Lethbridge Maple Leafs winning the 1951 World Championships in Paris, the last time France hosted the World Championship. 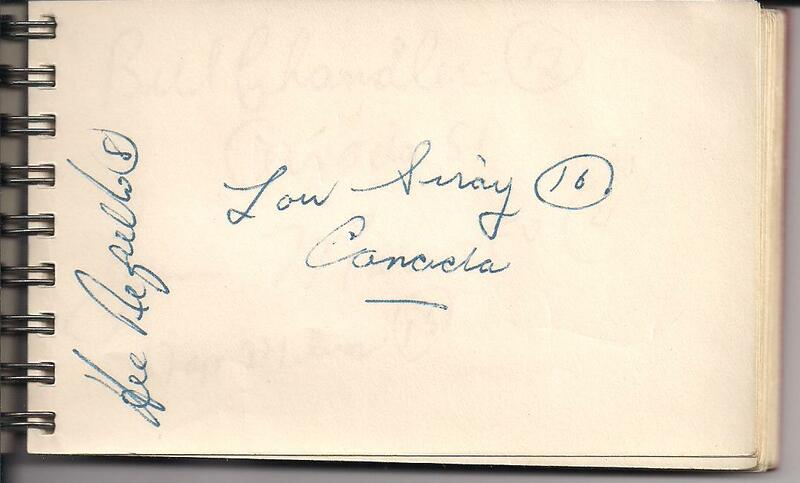 Thanks also to James Sinclair for the coordination and photos from his collection. 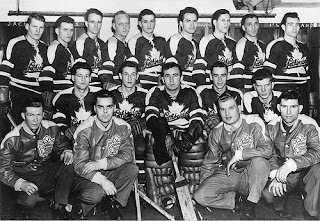 If you have memories or photos from the Lethbridge Maple Leafs journey please contact us justcdgroup@gmail.com We would like to post them on this site. 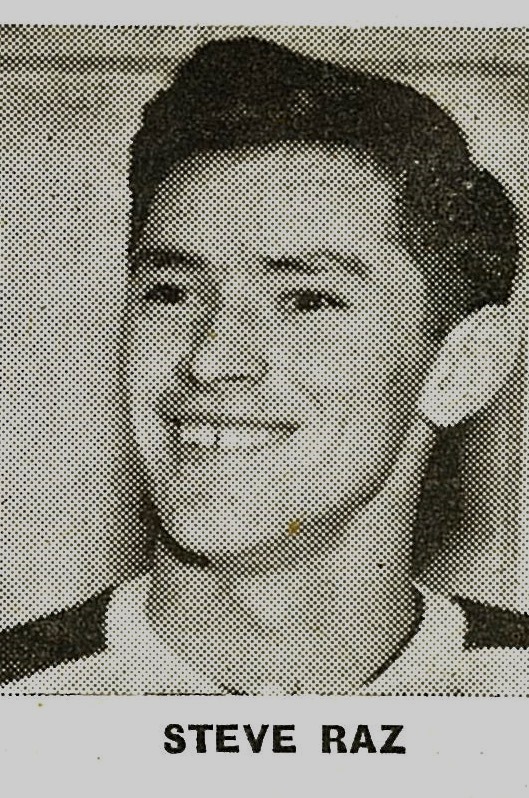 On behalf of Trevor Esau and Darcen Esau of the LethbridgeMapleLeafs.com and Justgroup.ca we would like to express our sincere condolences to the Malacko family. Jim "Shorty" Malacko passed away on December 25, 2016. 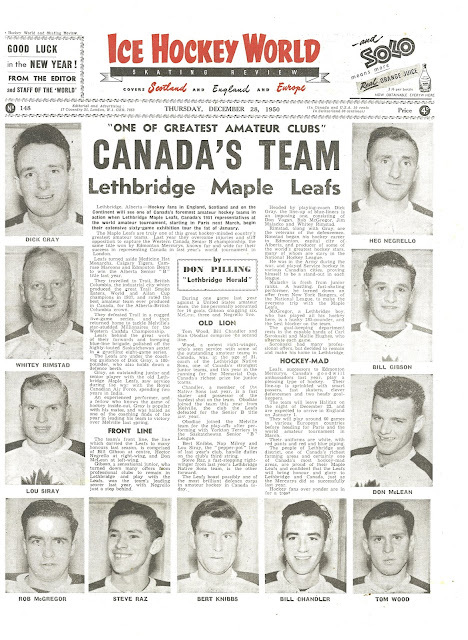 We would like to take this opportunity to thank you for being been so helpful and supportive in our effort to bring the Lethbridge Maple Leaf story to the world. We continue to receive page views from all over the world and occasionally we receive stories and photos from our readers. Thanks to all of you! 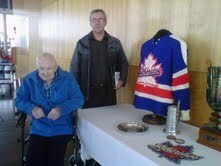 In particular, we want to thank honourary Lethbridge Maple Leaf, James Sinclair, pictured below. 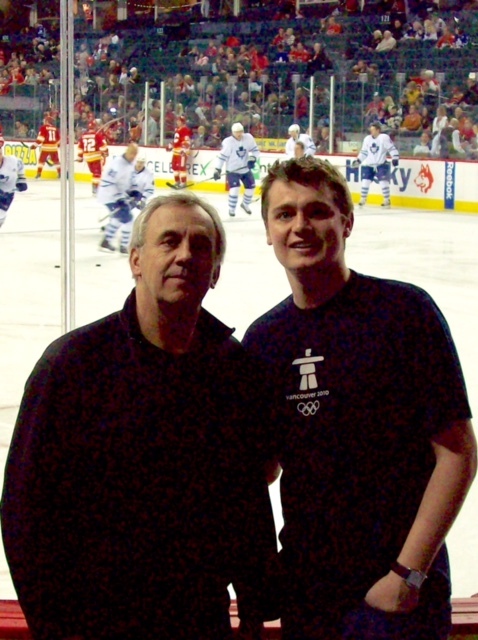 James continues to be the Number 1 fan of the Leafs and he has contributed many photos, videos, comments and background information to this site. 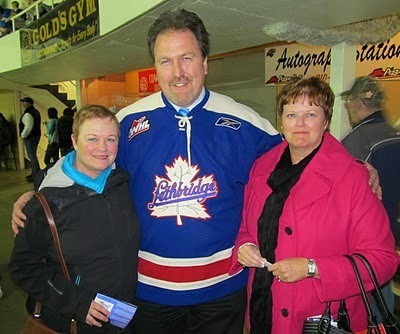 James also played a large role in organizing the family night for the Hurricanes replica jersey celebration. Thanks you James! 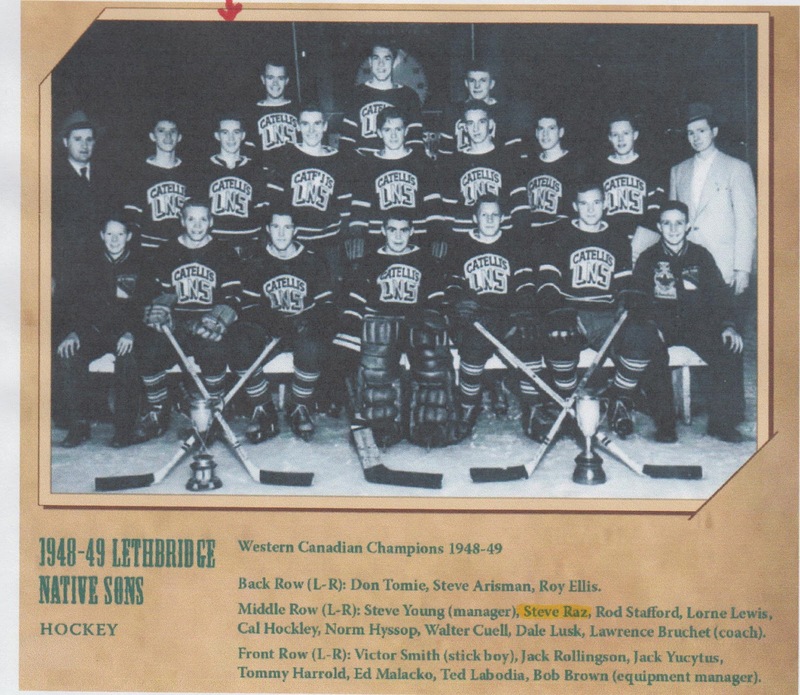 We would also like to thank the Galt Museum and Archives in Lethbridge, Alberta. Many of the photos are provided courtesy of the Galt Museum and Archives and especially Collections Technician- Kevin MacLean, pictured left. Kevin continues to alert us to collection donations from the Maple Leafs. Kevin also had a photographer take pictures of the collection for us to post. Thank you Kevin! We would also like to thank the Obodiac family for the use of the many references and quotes of Stan Obodiac's great book, No Substitute for Victory, ! The digital version is made available through the consent of the Obodiac family to the University of Alberta Library's Peel's Prairie Provinces, a resource dedicated to assisting scholars, students and researchers of all types! 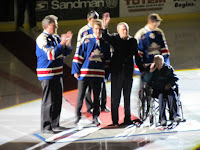 We would also like to thank those who encouraged us and promoted the site: Gregg Drinnan, Sports Editor, Kamloops Daily News; Phillip Pritchard, Hockey Hall of Fame; Terry Vogt, CTV News Lethbridge; Bob Nicholson, Executive Director, Hockey Canada; the Lethbridge Hurricanes for partnering on the anniversary night at the Hurricanes game, and many more! Ylva Lindstrom Sent us Photos, Autographs and Memories of The Maple Leafs Game Against Leksand IF! We were very fortunate to receive an email from a fan at one of the Lethbridge Maple Leaf games in 1951! We would like to thank Ylva Lindstrom (maiden name Hakansson) who was just 12 (pictured below) when the Maple Leafs came to town to play her team Leksand IF. 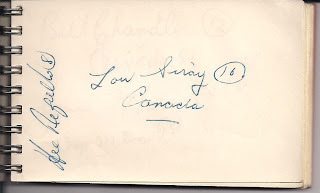 Mrs. Lindstrom provided the pictures below and the following email telling us her story! 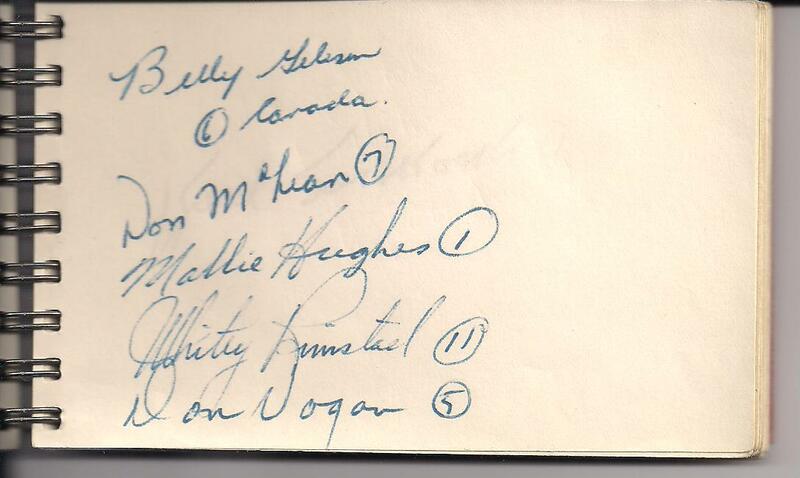 She also collected the autographs of the Lethbridge Maple Leaf players and provided us with a scan of them, below! 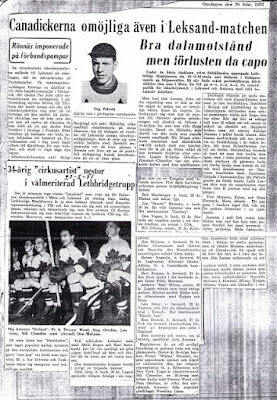 Hi, in 1951, as a young girl, 12 years of age, I watched a home game for my team Leksand IF. 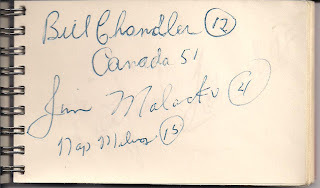 I took the opportunity to take the autographs of all the players in both teams. 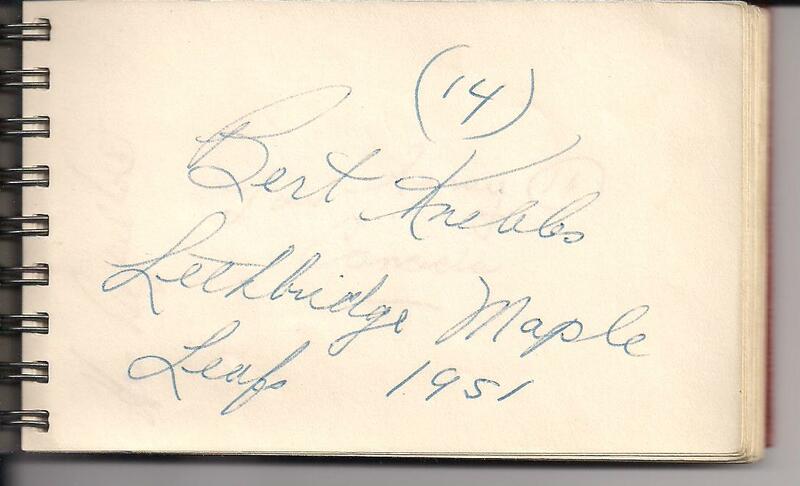 When I looked at them today I found the reference to your team Lethbridge Maple Leafs and googled it. 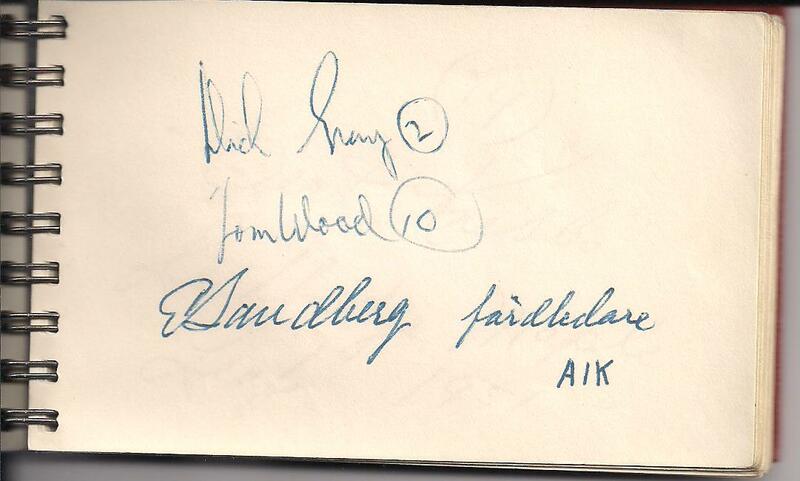 Thank you for keeping the blogg since it gave me the background information for the reason of my autographs. I do not have any memory from the game itself. 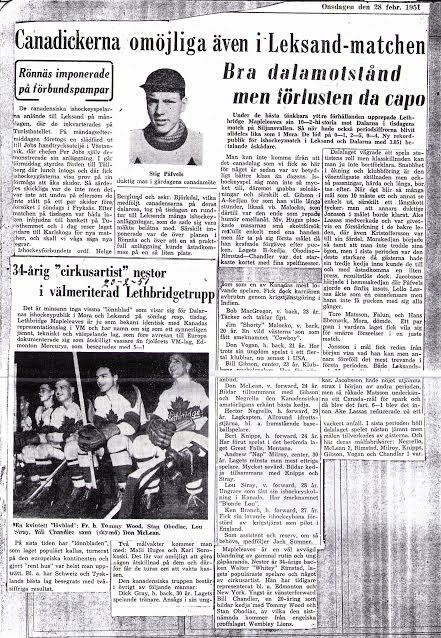 What I recall is though that it was a big event for the small town of Leksand. I got the autographs during on of the breaks of the game while the player's were resting in the locker room. 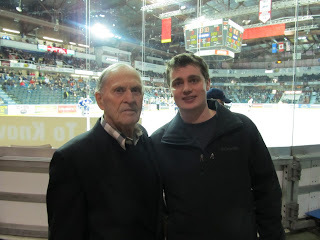 I went to the game together with my father Nils Hakansson who was very interested in ice hockey. I was also a great fan. 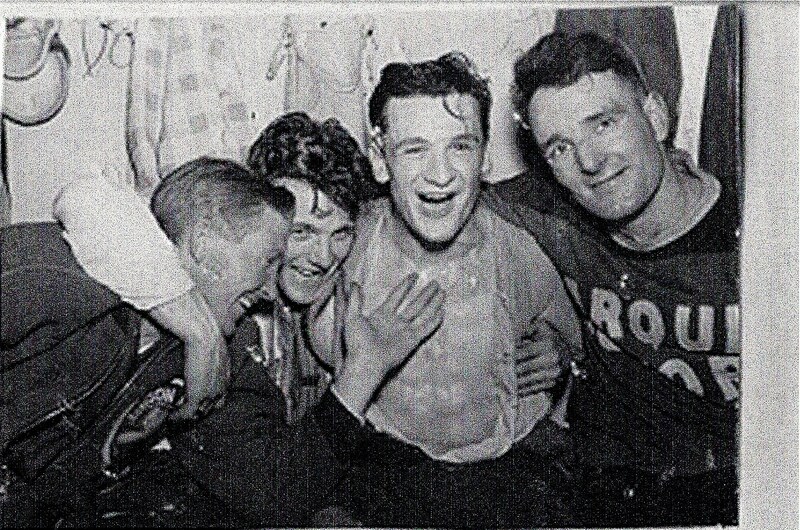 My father was a doctor and if anyone got injured at the game he was probably the one that attended to it. 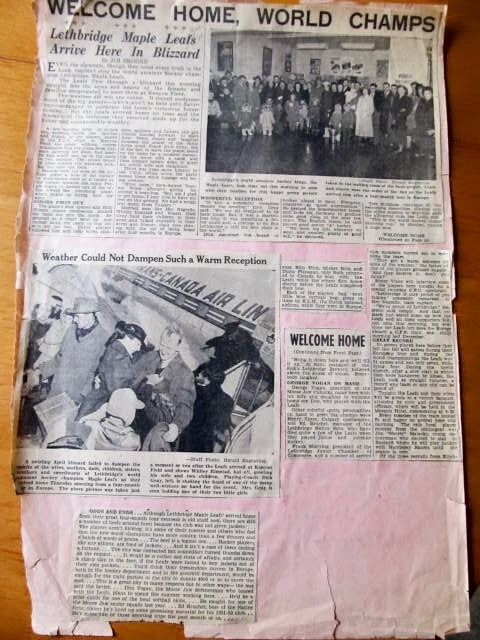 001: contains a picture of myself (june 1951) and two photos by professional photografer Olle Sellner. I must have bougth those pictures after the game. It shows the poster for the games (besides Leksand on Feb 27th at 8 pm, a second game must have been played in nearby city of Mora Feb 25th at 5 pm.). The tickets was on sale from Monday Feb. 19th. 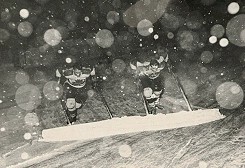 On the poster it also says that your opponent was Dalarna. It is the name of the county where Leksand is situated. 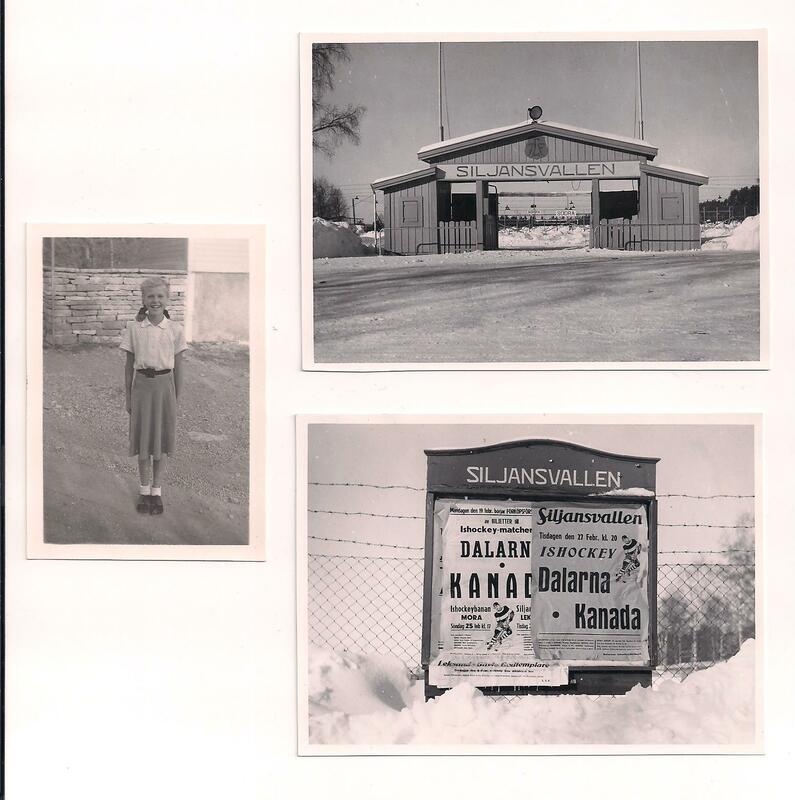 There is also a picture of the outdoor arena 'Siljanvallen' in Leksand. 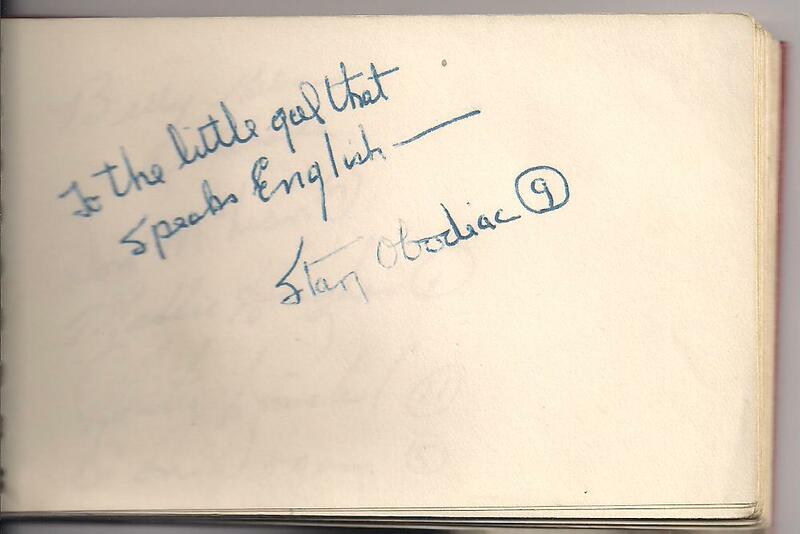 On picture 002 there is a nice dedication to myself from your captain Stan Obodiac. 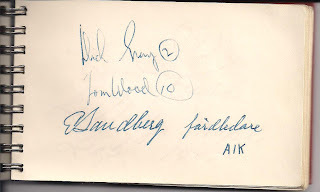 On picture 005 there is a signature by your teams swedish guide Ebbe Sandberg. On behalf of LethbridgeMapleLeafs.com and Just Group we would like to express our sincere condolences to the Milroy family. 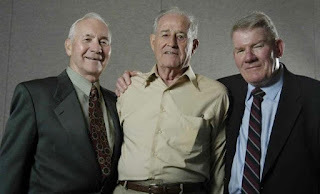 Mr. Andrew “Nap” Milroy passed away on Saturday, April 14, 2012. It was our honour to meet and interview Mr. Milroy as part of our research into the journey of the Lethbridge Maple Leafs to the World Championships in 1951. We were privileged to feature Mr. Milroy in several posts, below. 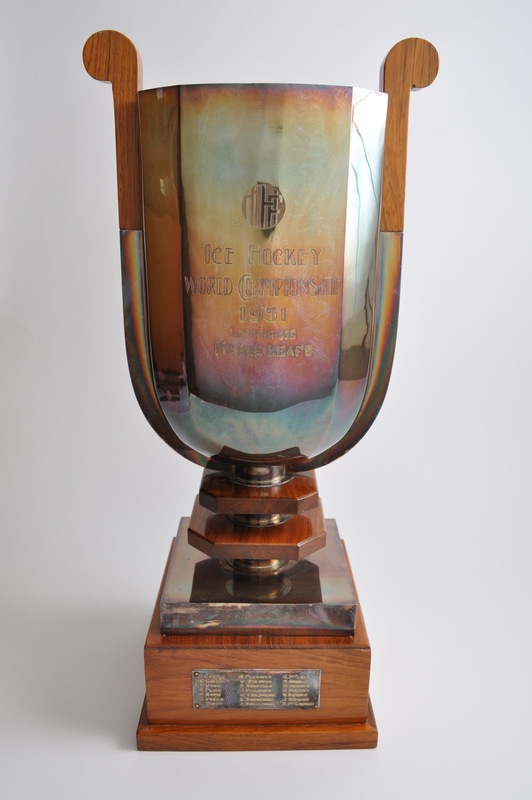 The international hockey community has lost a true champion. 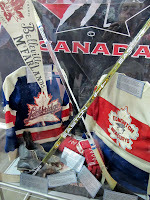 Maple Leaf collection at the Galt Museum. 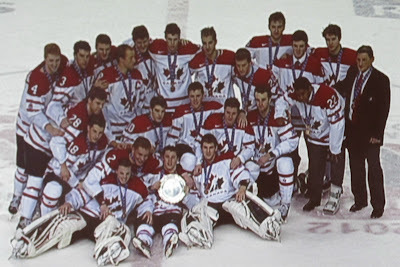 Hockey Canada put on an excellent show at the 2012 IIHF U20 World Hockey Championship 2012 in Calgary! One excellent part was the Hockey Hall of Fame display! 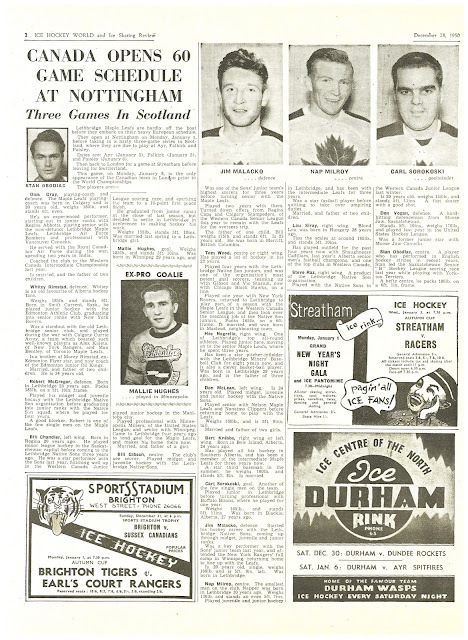 HHO and Hockey Canada brought in the Lethbridge Maple Leaf and Edmonton Mercury dispaly! 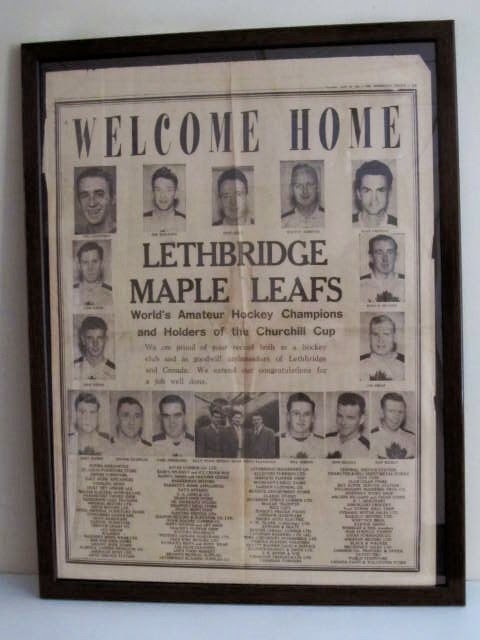 60th Anniversary Today-March 17: Congratultions to the Lethbridge Maple Leafs on the 60th Anniversary of your World Championship Victory! The Story in Pictures! 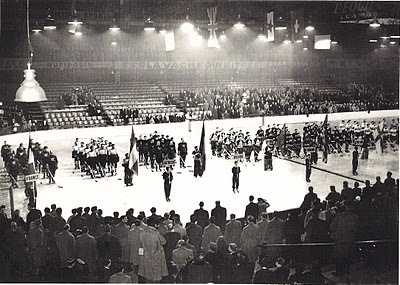 Today is the 60th Anniversary of the Lethbridge Maple Leaf World Championship Victory, March 17, 1951 in Paris, France. The Lethbridge Maple Leafs began the journey in early December 1950 in Lethbridge, Alberta. Including games in Canada they played 62 games. They won 51, lost 7 and tied 4. This included an amazing 44 game unbeaten string in Europe. By the time they were getting ready for home they had traveled close to 30,000 miles by bus, train, ship, airplane and car and played before about 400,000 people in 14 countries. 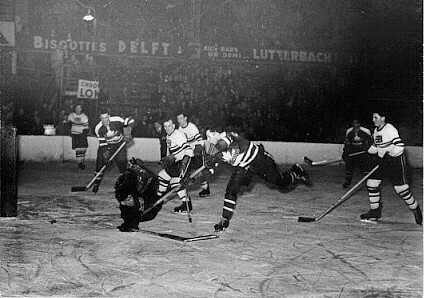 In the 6 World Championship games, the Leafs scored 62 goals and only allowed 6 goals against them. A truly dominating performance! 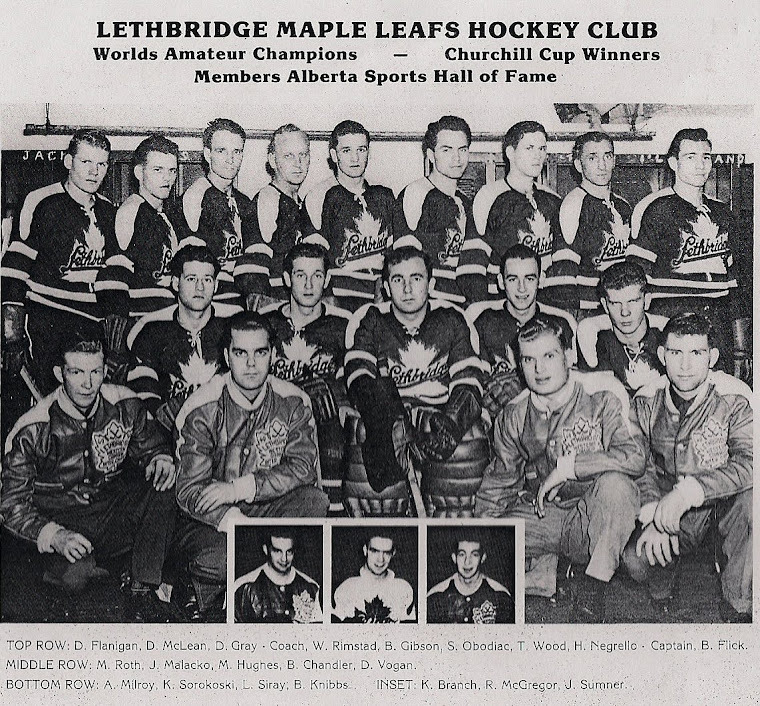 Lethbridge Maple Leafs Championship Rings: A Symbol of Lifelong Friendship. Lethbridge Maple Leaf Don McLean discusses how the Leafs finally received championship rings in 2001, 50 years after their world championship win. This "Ring Story" was featured on Lethbridge CTV News with Terry Vogt reporting in 2001. 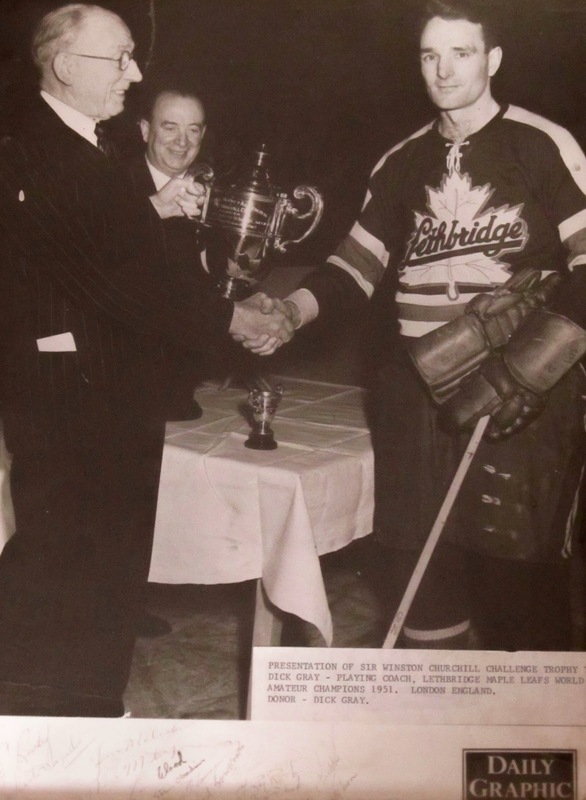 The drive to have the players receive the rings was spearheaded by long time Leaf fan James Sinclair. James was a key organizer of the 50th anniversary celebrations in 2001. 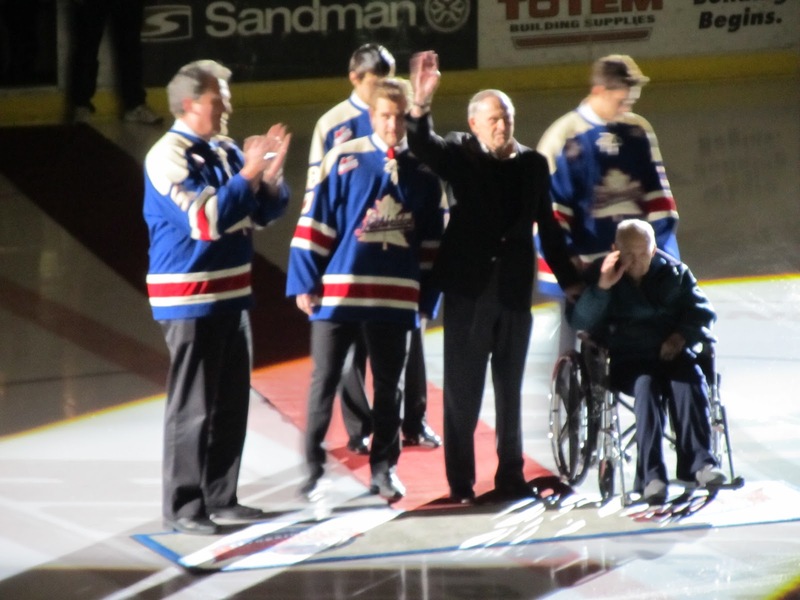 In appreciation for his work the Lethbridge Maple Leaf team members made James an honourary Leaf team member and he also received his own Leaf ring. 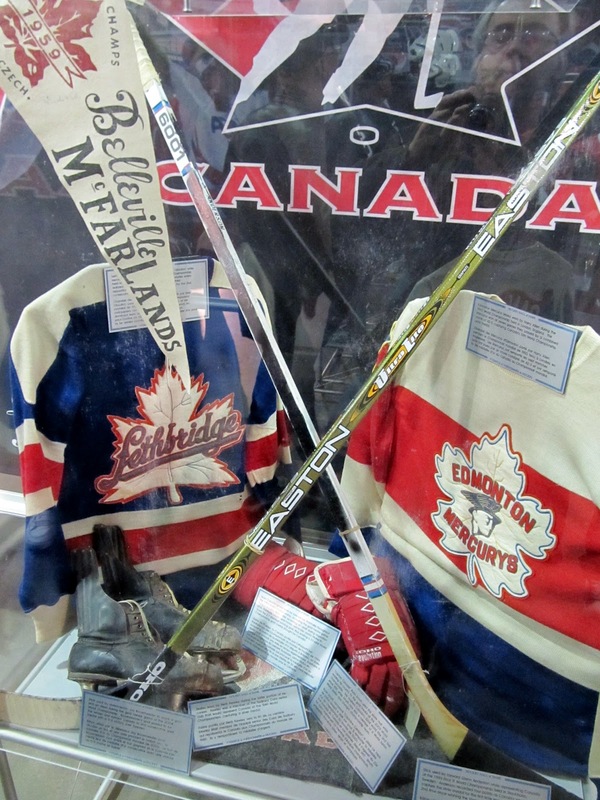 CTV News Lethbridge ran this story featuring Leaf Nap Milroy to highlight the Lethbridge Maple Leafs 60th Anniversary and the replica jerseys the Lethbridge Hurricanes wore in WHL league play. Heath Brown and Terry Vogt of CTV news with the story. 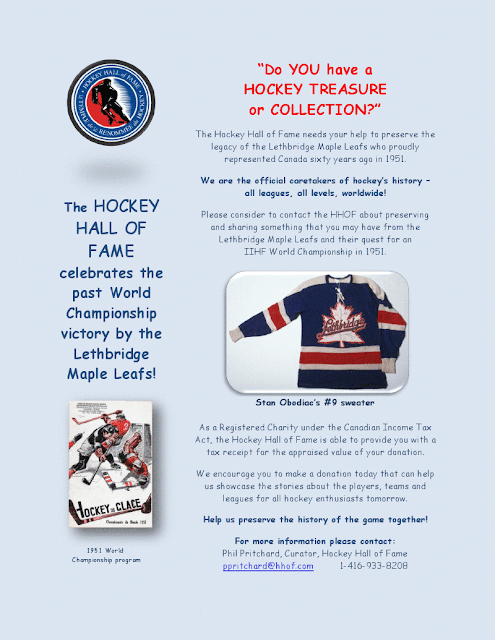 Hockey Hall of Fame Invites Donations to Their Lethbridge Maple Leaf Collection and Exhibit! VP and Curator Phillip Pritchard Extends Invitation! 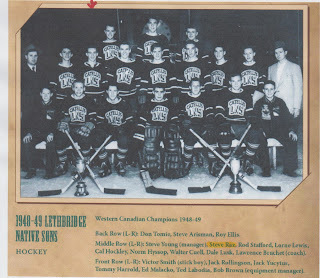 If you are a 1951 Leaf player or you are a family member or friend of a 1951 Lethbridge Maple Leaf player and have documents, pictures, diaries, jerseys, rings, trophies, medals and other hockey equipment of the 1950/51 season, the Hockey Hall of Fame would be very interested in preserving the artifacts in their collection as a way of celebrating the 60th Anniversary! 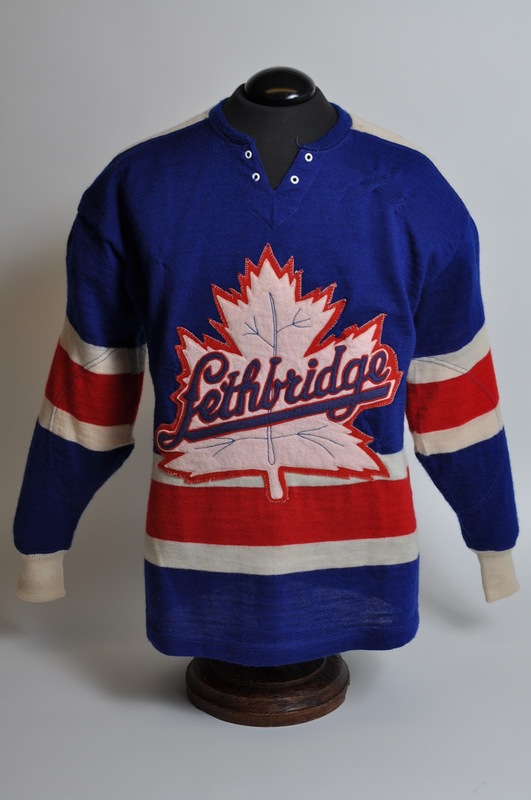 The Hockey Hall of Fame prides itself on having the premier hockey collection in the world and none of this can be done without the assistance of people like yourself and the people of Lethbridge. 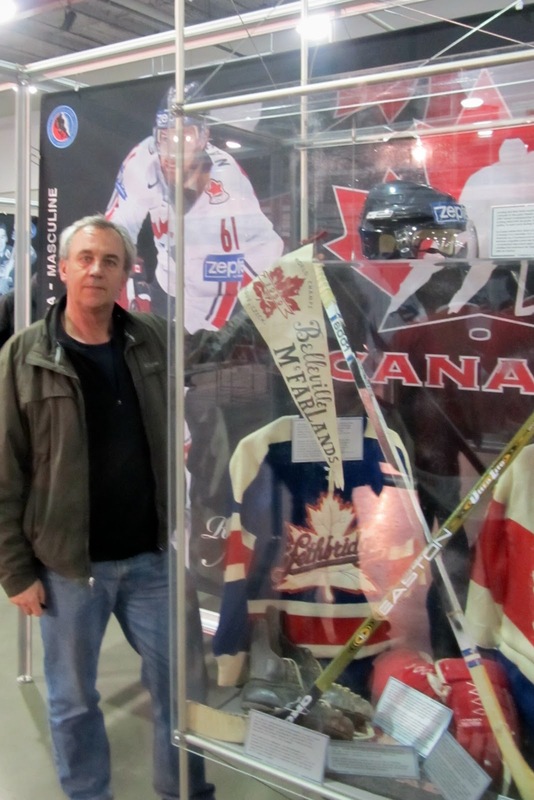 I wonder if any of the family members have jerseys from the teams the played in Europe (as a lot of teams traded jerseys then) or jerseys from other teams that might have played for prior to or after the Maple Leafs. 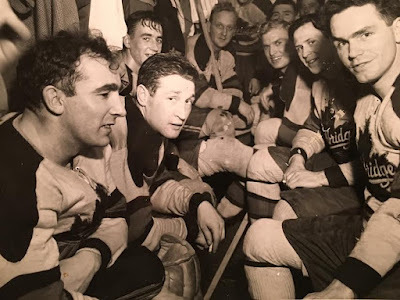 As you can appreciate the Hockey Hall of Fame tells the whole story of hockey, not just the NHL, World Championships etc....it would be great to add to the story by talking about players that played for the Maple Leafs and where they played prior to the World Champions and then afterwards. If you have a donation lethbridgemapleleafs.com would be happy to coordinate the gathering and delivery. Send us an e-mail at: lethbridgemapleleafs.com Thanks -Click on the poster below twice to enlarge﻿.